The Force USA Box Tube Safety is a great upgrade from the Pin & Pipe safety. Easily adjustable inside the rack and with nylon covers to protect your barbell makes the Box Tube Safetys one of the most user friendly safteys in the MyRack range. The MyRack is the only custom power rack manufactured using state or the art fully automated laser cutting and robotic welding technology. Each production run is tested to meet our rigerous safety standards and weight ratings to deliver the safest and highest quality power rack to your training facility. 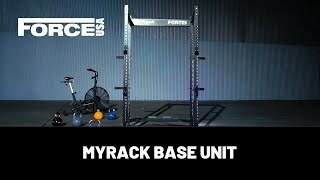 Force USA MyRack - Your Rack, Your Way, precision built from the ground up!